The story of a golden city in the Amazon intrigued the Spanish conquistadors. Since the 1970s, an underground system of tunnels containing gold if not alien artifacts have reignited interest if not imagination and lies. More than thirty years on, is there an underground realm? In 1973, Erich von Däniken, at the height of his fame, claimed in his book “The Gold of the Gods” that he had found a gigantic subterranean tunnel system in Ecuador. It was a major claim - and one that seriously would tarnish his profile, for his source would soon deny he had done no such thing. For many, the incident proved that von Däniken was a fabricator of lies - a much more damaging claim than being known to make outlandish claims that the gods were ancient astronauts. The story really begins in the Brazilian town of Manaus, on March 3, 1972, when a German journalist Karl Brugger met a local Amazonian Indian, Tatunca Nara, in the backstreet tavern Gracas a Deus. The meeting would result in Brugger’s book, The Chronicle of Akakor. The title of the book was supposedly the same title as the chronicle that the Amazonian tribe of which Tatunca was a member (the Mogulala tribe) held sacred - or at least central - to their mythology and philosophy. The mere notion that an Amazon tribe had a written chronicle itself was remarkable, as the Amazons are largely believed not to have a written language. A second bombshell was that Tatunca claimed that the Year Zero of the Chronicle was 10,481 BC - very much outside accepted archaeological dates for human occupation of the Amazon, but perfectly within the “Atlantis and Deluge” theory that many alternative researchers favored as the anti-thesis to the science-wrought framework. Thirdly, that the Gods came from a solar system “Schwerta”, and built an underground tunnel system in South America. Each element on its own and all together even more so made for a stunning “revelation” - or lie. What could and could not be proven? The best evidence would be to discover any of the several cities in the Amazon jungle, including thirteen underground cities, that this civilization had allegedly left behind. 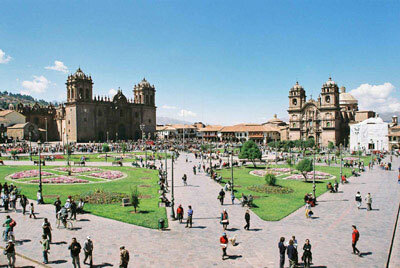 Their most important ancient towns were known as Akakor, Akanis and Akahim, as well as Cuzco and Machu Picchu. The first, Akanis, was built “on a narrow isthmus in the country that is called Mexico”, at a place where the two oceans meet (Panama?). The second was Akakor (apparently derived from Aka, i.e. fort, and kor, i.e., two - Fort Two) and lay far up the Purus river, in a high valley in the mountains of the border between Brazil and Peru. Tatunca added that the city had a Great Temple of the Sun, that it contained documents, such as maps and drawings telling the history of the Earth. on the left above ground, on the right, below ground. 26 stone - the material not being a common commodity in the Amazon - cities were built around Akakor, including Humbaya and Paititi in Bolivia, Emin, Cadira in Venezuela, etc. It meant that there was very little to check out on the ground. Tatunca’s claims seemed to be unverifiable. Still, Paititi was a known legend, held to be the last refuge of the Incas at the time of the Spanish Conquest, but no-one knew whether it was myth or real. Did Tatunca hijack it to “substantiate” his own legends? The third fortress was Akahim, which was apparently not mentioned in the chronicle before the year 7315, was linked with Akakor, and was situated on the borders of Brazil and Venezuela. Finally, Cuzco and Machu Picchu were genuine towns, but the latter’s history definitely did not stretch anywhere as far back as even 1000 BC and seemed void of any ancient astronaut. Was Tatunca telling the truth or was he a con artist? It was a very tall tale, and with the stakes being very high, Brugger decided to investigate and see where the rabbit - or Tatunca - would take him. Still, the two decided to go on an expedition in search of Akahim. They set off on September 25, 1972, on a trip that would last six weeks. Akahim, unsurprisingly, was not discovered. We note, however, that Brugger’s story does not speak about Ecuador, but that von Däniken did. And Tatunca was not von Däniken’s main source of information. That “credit” goes to Juan Moricz, a Hungarian born engineer and the person who claimed he had discovered caves and a series of tunnels in Ecuador. 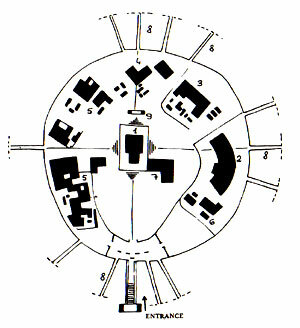 He had taken von Däniken to a secret side-entrance, through which they could enter into a large hall of the labyrinth. 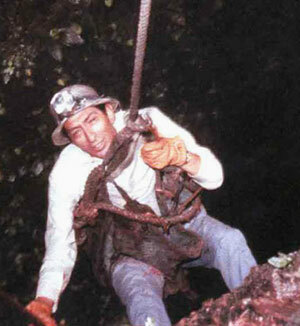 Moricz claimed that the tunnels continued for hundreds of miles, across - or under - the Amazonian rain forest. Von Däniken included this event in his “The Gold of the Gods”. But when the book got published, journalists from the German Spiegel and Stern interviewed Moricz, who now denied ever having been in the cave with Erich von Däniken. It undermined von Däniken’s credibility - though some would argue he had none to begin with - branding him a liar. No-one seemed to note that if von Däniken had been lying, he would not have left a trail to Moricz: he could have claimed he could not reveal his source and Der Spiegel and Stern would never have been the wiser. Instead, it seemed that “something” was amiss with Moricz. Equally bizarre was that even though von Däniken was taken to be an inventor who created tunnels out of nothing, Moricz merely denied having taken him there - the existence of the network itself, he did not deny. So, in short, Moricz had claimed to von Däniken he had discovered caves and showed these to him. Now, he claimed to have seen the caves, led there by a guide whom he could not identify, but denied having taken von Däniken there. The logical conclusion seemed to be that Moricz had shown something to von Däniken, was now caught by the fact that everyone seemed to know he had done so, and that he had to make sure that whoever showed him, did not bear any grudges against Moricz, no doubt because Moricz himself would most likely have been asked not to show anyone else the site. In 1976, The Chronicle of Akakor was published and the controversy was reignited, though von Däniken and Moricz seemed to be missing from the scene. Still, amongst the core message of the Chronicle was the statement that there was a network of tunnels, some of it still in existence today and used by the Indians. On his part, during the summer of 1977, von Däniken traveled for a third time to Manaus, to meet with Tatunca Nara, in the hope that via Tatunca, he could produce evidence and vindicate himself - Moricz, it was clear, was a dead end for von Däniken. Apart from von Däniken and Brugger, a third European entered on the scene: a former Swissair pilot Ferdinand Schmid was living in Brazil and contacted Tatunca Nara in 1975. In 1977 and 1978, the pair made several attempts to penetrate into the jungle, in search of Akahim. 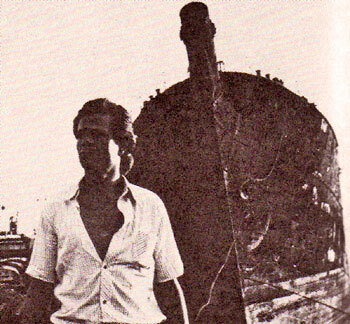 The 1978 expedition was joined by an archaeologist, Roldao Pires Brandao, added to the team by the Brazilian government. He was also the reason why the mission had to be abandoned: Brandao apparently shot himself in the arm. But once recovered, he interested the Brazilian authorities in setting up an expedition of their own. He set out with six men. In its August 1, 1979 issue, Veja, a Brazilian newspaper, reported the discovery of Akahim, including photographs. That same year, Tatunca and Schmid claimed to have found Akahim too - sort of. Early on, Tatunca had stated that Akahim had three large pyramids and they claimed to have found these. Still, though seen, they had not been visited the site and Schmid lost - or claimed to have lost - his camera and film. It was the timeframe when the Moricz and Tatunca stories merged - Tatunca stated that he knew Moricz, when he was staying in Venezuela in 1967. So two separate stories of underground tunnels were now possibly linked. Still, Moricz apparently found the hill system independently from Tatunca in Ecuador - and Tatunca was searching in Brazil. The story received an entirely new dimension when Karl Brugger was murdered outside his apartment in Manaus by an unknown assailant. Though a life does not cost much in Brazil and armed robbery is even more violent there than in the rest of Southern America, the question remains whether his murder had anything to do with his book and/or knowledge of Akakor. It meant that by 1980, the story seemed to have stalled - though the Brazilian government apparently had confirmed the existence of the city. Is the implied message that the Brazilian’s “1979 confirmation” should always carry parentheses and that we should no longer believe in the stories of Tatunca and Moricz - were they indeed conmen and did both Brugger and von Däniken (and Schmid) fall for their lies? Akakor, Akahim and Akakis remain undiscovered - though on occasion the Internet is abuzz with the sound of rumors and unclear photographs. But we note that Tatunca also spoke of Cuzco and Macchu Picchu. And it is in Cuzco that - totally unexpected - confirmation about the existence of a network of tunnels came. The man responsible for this is Javier Sierra, now best known as the author of the novel “The Secret Supper”. He noted that at the time of the Spanish conquest of Peru in 1533, several items of tremendous importance were hidden, including a solar disc, which has never been found since. It was labeled the “Treasure of Inca King Atahualpa”. Rumors had it that it was secreted away in tunnels. This rumor was linked with stories about a tunnel leading from the Coricancha Temple - the main Temple of the Sun in Cuzco - and exiting near Sacsayhuaman, the fortress that towers above the city. “The celebrated cave of Cuzco, called Chinkana by the Indians, was made by the Inca kings. It is very deep and runs through the centre of the city, its mouth or entrance being in the fortress of Sacsayhuaman. It comes down on the side of the mountain where the parish of San Cristobal is situated and, with varying degrees of depth, ends at the site which is now Santo Domingo and was in Inca times the famous Temple of Coricancha. In the 17th century, an effort was made to find the treasure supposedly hidden underneath the Inca capital. After a team spent several days underground - “somewhere underground” - only one person came out alive. He emerged from an opening under the main altar of the church of Santo Domingo, the site of the Coricancha. Most importantly, the survivor brought with him an ear of corm made of solid gold. A century later, in 1814, Brigadier Mateo Garcia Pumakahua showed his superiors part of the treasure. He took an officer blind-folded through the main square of Cuzco, to a stream and then, after removing some stones, proceeded down a stone stairway into Cuzco's underworld. Once the blindfold was removed, he saw large silver pumas with emeralds, “bricks” made of gold and silver, etc. He stated that when witnessing these treasures, he could hear the clock of the Cathedral of Cuzco ringing above. It seems everyone in Cuzco was walking on gold, without knowing it. 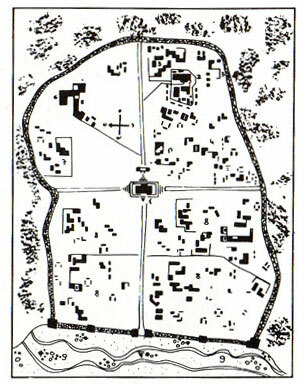 Javier Sierra worked with Vicente Paris, who drew a hypothetical line on a satellite map: he noted that the Coricancha, the convent of Santa Catalina, San Cristobal church and Sacsayhuaman were aligned; the tunnel would thus run perfectly straight. They decided to undertake some work in 1993 to confirm the ancient accounts and their new hypothesis. They chose the main altar of Santo Domingo, to check whether an opening was indeed present there. Like Moricz, this person was thus claiming that the underground network extended for “hundreds of miles”. Still, there was - no doubt unexpectedly - a problem: the main altar entrance to the underground system was partially closed after the earthquakes that hit the city in 1950. When work was carried out to strengthen the foundation of the church, a UNESCO report catalogued four crypts in the monastery. One Spanish explorer Anselm Pi Rambla claimed that he had entered the structure in 1982. 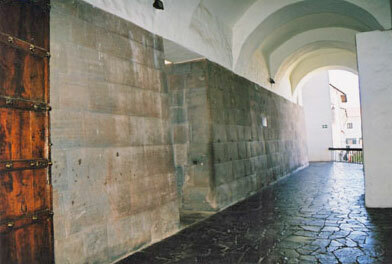 Gamarra added that the original walls of the Coricancha had been excavated. He found out that there was a stream originating in the main square, running to the old walls of the Coricancha, under the church. To him, it showed that a natural passage connected the various structures. In 1999, Anselm Pi Rambla negotiated with the National Institute of Culture, the palace of Government and Father Gamarra to arrange the conditions for the exploration beneath the Monastery of Santo Domingo in search of the Inca tunnel. Sponsored by a Texan financier Michael Galvis (cost: $760,000), the project got underway in August 2000, using ground penetrating radar to map the underground tunnel. "beneath the altar of Santa Rosa, about four or five meters down, we located a cavity two meters wide that we believe can be the entrance to a great tunnel." The fourth crypt that had been identified by UNESCO, but had since “disappeared”. So with one tunnel known to exist, what happened to the Moricz saga after it had torpedoed von Däniken’s credibility? One person to continue the quest for the metallic library was Stan Grist, who claimed to work with Juan Moricz, and his confidante, Zoltan Czellar. They name the cave that von Däniken entered the Cueva de los Tayos, which is a well-known and well-visited cave, apparently without any of the exotic artifacts that should - or could - be in there. “As I write these words, I am in negotiations with the native Shuars who live near the Cueva de los Tayos, whose permission is necessary to enter and explore the area of the caves. I plan to mount an expedition in coming months to search for the secret entrance to the cave from which the alleged metallic library can be accessed. 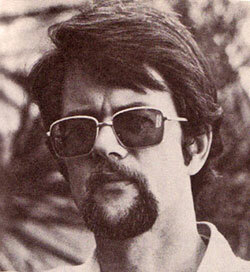 Grist is not alone in his chase: Stanley Hall is chasing it too. 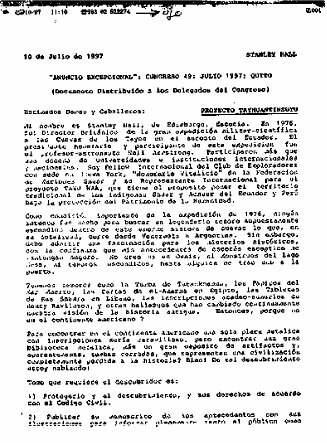 A Scotsman from Edinburgh, he created a document that was, according to Grist, apparently “secretly presented” to the Ecuadorian Congress in July 1997. This document lays out secret, never before revealed information about the contents of the "Cueva de los Tayos". The origin of this information dates from when Hall was the leader of an Ecuadorian-British expedition in 1976. To his credibility, Hall can show that he knew Moricz in 1975 and that the following year, he took this expedition to the caves - an expedition which included the First Man on the Moon Neil Armstrong. Hall claims that when Moricz died in 1991, he met with the mysterious missing person in the story, alluded to by Moricz though not by name. During six years of questions and collaboration, Ecuadorian citizen Petronio Jaramillo A. was accepted by Hall as the true source and custodian of the treasure story. The story, as usual, had an unhappy ending: In 1998, when Hall was in Britain initiating the plan for an official 'expedition of occupation', he received by telephone the sad news from the mother of Petronio that he had been assassinated. It meant that no members of the original expedition remained available as guides to enter the reputed miracle location. Unfortunately, the archaeological potential is greatly outweighed by the more esoteric theories that Hall has injected into his published account: a Golden Age of Saturn, the destruction of Atlantis, Ptolemy's lost city of Cattigara, the sudden rise and fall of wonder civilizations, the sublime 'lemming factor' inherent in the collective consciousness of Mankind just form part of the theories Hall promotes. So where does this leave the golden tunnels? In Cuzco, they have materialized. Elsewhere, they remain tall tales. Since the 1970s, the Amazon has become much more open to the world and parts where Brugger had great difficulty in getting to, are now less so. At the same time, did Tatunca merely drive Brugger in the jungle, knowing they would at some point hit an obstacle, which would necessitate their return home? The same cannot be said of Moricz. He may have been a teller of tall tales, but seems to have definitely shown something to von Däniken and afterwards was always on the defensive. Still, even if a tremendous treasure lies hidden in the Ecuadorian cave - and this would make a monumental discovery in itself - can we truly assume that a network of thousands of kilometers of underground caves truly exists? And whereas an underground network of caves in Cuzco is logical and not out of the ordinary, no evidence has been found they continue for hundreds of miles. But it is equally clear that something is out there… and we are only slowly able to reclaim it.